From ground-based telescopes, the so-called "ant nebula" (Menzel 3, or Mz3) resembles the head and thorax of a garden-variety ant. This dramatic NASA/ESA Hubble Space Telescope image, showing 10 times more detail, reveals the "ant's" body as a pair of fiery lobes protruding from a dying, Sun-like star. The Hubble images directly challenge old ideas about the last stages in the lives of stars. By observing Sun-like stars as they approach their deaths, the Hubble Heritage image of Mz3 -- along with pictures of other planetary nebulae -- shows that our Sun's fate probably will be more interesting, complex, and striking than astronomers imagined just a few years ago. Though approaching the violence of an explosion, the ejection of gas from the dying star at the center of Mz3 has intriguing symmetrical patterns unlike the chaotic patterns expected from an ordinary explosion. Scientists using Hubble would like to understand how a spherical star can produce such prominent, non-spherical symmetries in the gas that it ejects. One possibility is that the central star of Mz3 has a closely orbiting companion that exerts strong gravitational tidal forces, which shape the outflowing gas. For this to work, the orbiting companion star would have to be close to the dying star, about the distance of the Earth from the Sun. At that distance the orbiting companion star wouldn't be far outside the hugely bloated hulk of the dying star. It's even possible that the dying star has consumed its companion, which now orbits inside of it, much like the duck in the wolf's belly in the story "Peter and the Wolf." 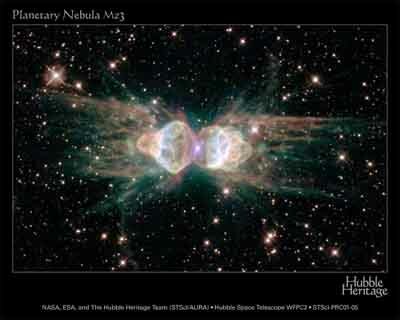 No other planetary nebula observed by Hubble resembles Mz3 very closely. M2-9 comes close, but the outflow speeds in Mz3 are up to 10 times larger than those of M2-9. Interestingly, the very massive, young star, Eta Carinae, shows a very similar outflow pattern. Astronomers Bruce Balick (University of Washington) and Vincent Icke (Leiden University) used Hubble to observe this planetary nebula, Mz3, in July 1997 with the Wide Field Planetary Camera 2. One year later, astronomers Raghvendra Sahai and John Trauger of the Jet Propulsion Lab in California snapped pictures of Mz3 using slightly different filters. This intriguing image, which is a composite of several filters from each of the two datasets, was created by the Hubble Heritage Team.